This romantic park is an oasis of peace and tranquility just a few steps away from the hustle and bustle of Prague’s city center. With the tall, old trees, raising their branches to the sky and breathtaking views of the Vltava River and Hradčany is perfect for charming and pleasant walks through the landscaped gardens. Here, you can relax and read a book on one of the benches, have a picnic, or simply pass time in one of local cafés or pubs, or play with your kids on one of the playgrounds. 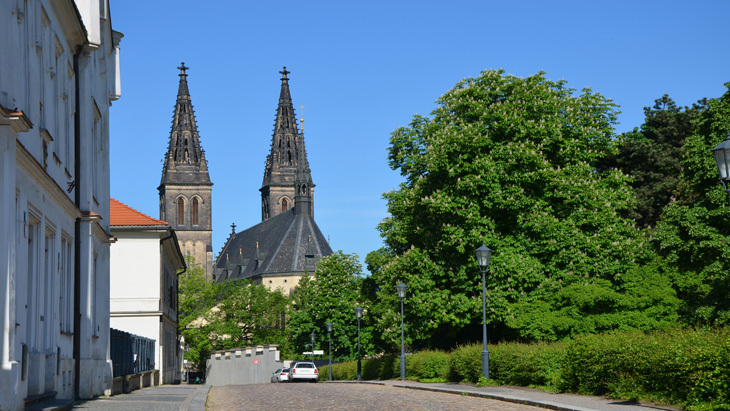 Few areas of Prague are as quiet and peaceful as Vyšehrad, the complex covers a large area, with several interesting parts to explore. The St Peter and Paul Church and its two dominant spires seen from all around are the landmark of the city. The interiour of the church has been restored and open to the public. Noteworthy is the adjacent cemetery Slavín, where many of Prague’s great artists, musicians and politicians lie buried. Most famous are the graves of the composers Antonín Dvořák and Bedřich Smetana, the painter Alfons Mucha, or the writer Karel Čapek. In the park, there are huge statues depicting figures from Czech mythology, although these are only replicas, the original works are kept in the Lapidarium. Worth seeing is also the Romanesque rotunda of St. Martin that dates back to the 11th century. The park makes for a nice visit at any time of the day and the views at sunset can be stunning too.